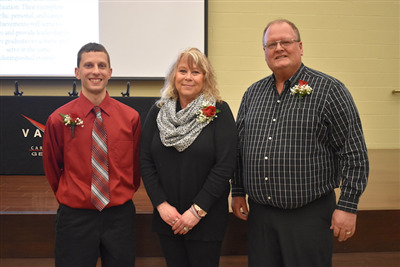 VAN WERT – Christina Gonzales, James Shaffer, and Randy Warnecke were inducted into the Vantage Hall of Fame during the 42nd Vantage Career Center All Boards Dinner and Alumni Hall of Fame Induction Ceremony on Thursday. After a dinner created by Vantage Culinary Arts students and recognition of the 16 Boards in attendance, Vantage Superintendent Rick Turner presented the Vantage Alumni Hall of Fame winners with a plaque. Christina Gonzales took Early Childhood Education and graduated from Vantage and Paulding Exempted Village in 1981. Later, as director of operations and CEO of PC Workshops, Inc., she incorporated a model that allowed those with developmental disabilities to maintain work and earn wages. Gonzales' son was born without a left hand. While there were many obstacles put in his way, Gonzales instilled in him determination and encouraged her son to overcome those obstacles. During her son’s high school wrestling years, Gonzales was able to impact many young individuals. “For the past 30 years she has used the skills learned here at Vantage to work with children and adults with developmental disabilities,” said Vantage High School Director Tony Unverferth. Some of Gonzales’ involvement in her community include the Paulding Chamber of Commerce, Paulding Economic Development, Mandale Church of Christ, John Paulding Days, Paulding County Special Olympics, and Paulding youth sports. James Shaffer took ag-business at Vantage and was part of the first graduating class in 1977. His home school was Mendon- Union. After graduation, Shaffer continued to work for his father on his 300-acre farm where he still farms today. Shaffer also found work at area businesses, but in 2000, when the plant he worked for moved, Shaffer decided to further his education to obtain his realtor’s license. For the last 18 years as a realtor, Shaffer has sold over 700 homes and farms in Mercer and Van Wert Counties. “I am living proof that Vantage is not just for those looking to learn a trade immediately following high school, but also for those who are willing to utilize what they’ve learned here and used it for an entire lifetime,” added Shaffer. Shaffer was the first Vantage graduate appointed to the Vantage School Board where he represented Parkway from 1998 to 2000. He served on the Parkway School Board from 1997 to 2002 and also served on Mercer County Educational Service Center’s Board from 2000-2004. Shaffer is the past president and the vice-president of the Mendon Lions Club, serves as secretary of the Grand Lake Toastmasters Club, and is the president of the Mendon Union Alumni Association. Randy Warnecke took carpentry and graduated from Vantage and Ottoville Local Schools in 2004. As a Vantage student, Warnecke placed twice at the Skills USA State competition. He went on to the Skills USA National competition as a senior where he placed 4th. After graduation, Warnecke went on to use the skills he learned at Vantage to create custom cabinetry along with building and construction layout and framing, both professionally and personally. Currently, he is employed at Lima Millwork and has used his skills to build his family’s home and personal workshop. Warnecke serves on the Carpentry Advisory Committee at Vantage for the past 13 years where he has continued to support and bring a positive light to Vantage Career Center. He is also a men’s auxiliary life member at the VFW Post 3740 in Ottawa. Each inductee will be added to the Hall of Fame wall. Prior to the induction, Turner spoke about what the last year at Vantage looked like. In the past year, Vantage has issues 807 industry-recognized credentials. The center issued a Class A CDL to four high school seniors in the last year, and there are currently 15 seniors training for a CDL. In the past year, Vantage held a two-day middle school student career exploration camp where 90 students signed up, and 80 students attended each day; 15 students were on a waiting list. Vantage also obtained an Ohio Department of Public Safety three-year Fire Charter. The Level 1 Fire Class began in February with 12 participating fire departments. Currently, one high school student is enrolled in the program. Entertainment for Thursday evening’s event was provided by the Wayne Trace music department. The Vantage Color Guard presented the American Flag prior to the evening’s ceremonies.